What could be the possible reason that you wanted to bring changes in your life? or what could be the changes you want? 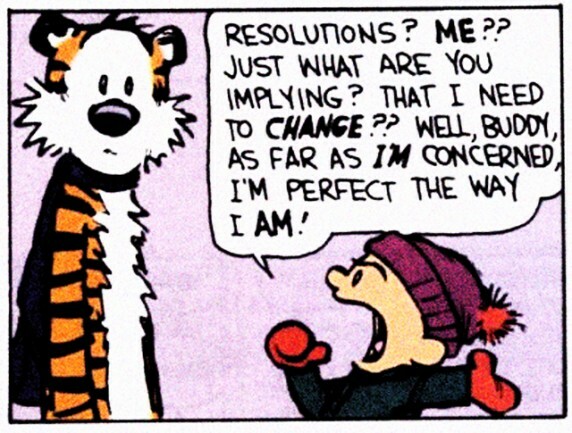 why do we even make a resolution? Is it because we feel a pride of taking life more on a serious note? Is it because somebody asked you to? either ways, we are trying to resolve it. Right? Status on Facebook, Twitter and all social network will be filled with the cliche quotes of 'New Year, New me' Or something like, 'it's New Year, time to start doing this, time to stop doing that' and so on... What exactly does a 'New Year, New Me' even means? Does it mean you are going to change your whole self ? Is that even possible? I mean all this time you have been the same you and suddenly as New Year comes.... you want to bring a quick transformation. Well, good for you... if it is so easy or if that is what you want/need? For some past years, I have realized the fact that changes are not exactly what we need, it is what we wish to see in ourselves, but if we ain't ready for it or if it doesn't comes to us despite working hard then why force? Finally, I decided and came to the conclusion of making only one resolution and that was... to bring no change but to 'upgrade' myself, because I really don't intend to change myself. You don't necessarily need to make a long list of resolution and be disappointed for not following them at the end of the year. Instead why not attempt to upgrade or strive to update the old You. And, if you really have to transform yourself, it will come by itself with time, you won't find yourself forcing into it. So... What resolution have you made for this New Year? Try to change completely or upgrade your old version? Choices, all yours. May this New Year brings in more Love, Happiness, Blessing, Prosperity and all things Extraordinary! !